If you took food out of your church’s weekly activities, many of those activities would look very different—or they’d simply disappear. A partial primer on biblical foods. From the beginning of the church, Christians have both feasted and fasted. This timeline highlights some important moments in each of those journeys, especially ones discussed in this issue. 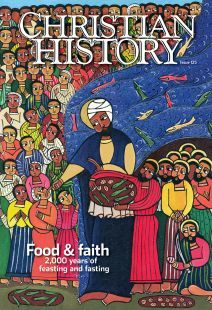 Here are some recommendations from CH editorial staff and this issue’s authors to help you understand the story of food and faith.